For the third time, Watershare is taking part of the biennial IWA Congress & Exhibition. Watershare was launched at the 2012 IWA Congress in Busan, South Korea. 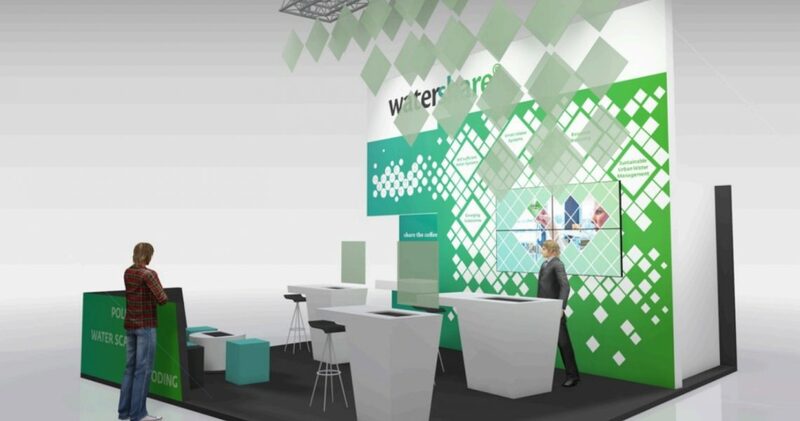 Since then, Watershare has been present – in 2014 and now this year – with its own stand, in its recognisable green-white house style, on the trade fair’s floor. In Watershare experts from 17 partner organisations share their knowledge and expertise with each other. Divided into five Communities of Practice (CoPs), they work in concrete, regional/local projects on solutions to practical problems and the development of highly specialised (software) tools. The Watershare Suite currently includes 26 tools. The stand highlights Watershare’s Communities of Practice, the partners’ ongoing projects and, of course, Watershare’s 26 tools. The partners can make use of the stand’s many screens to present subjects to the visitors. On Monday, 10 October, the Subsurface Water Solutions Community of Practice will be launched in celebratory fashion. This event will also take place at the Watershare stand.